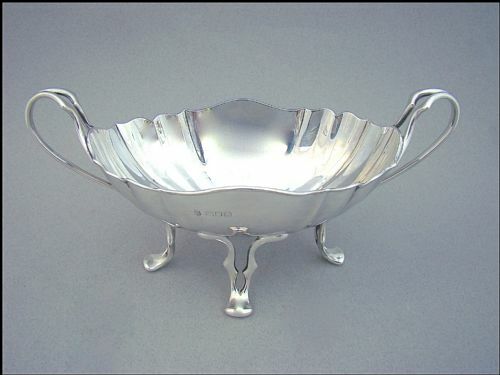 This is a fabulous 8 inches, solid silver, pedestal dish or comport dated Sheffield 1928 and made by Charles Boyton & Sons. The shallow dish of circular form with scrolling pierced gallery and applied with a cast fruiting vine border. Standing on a circular stepped foot. It has an excellent gauge of silver and feels heavy when picked up. CB&S for Charles Boston & Sons. Date letters "v" for 1928. Diameter: 21cm / 8 inches. Height: 5cm / 2 inch. Weight: 450g / 14.4 oz. 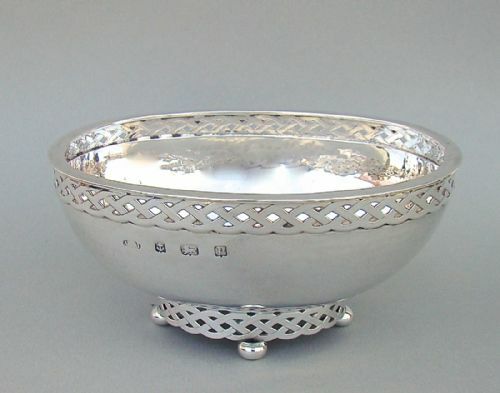 This simple and elegant spot-hammered silver bowl bears the marks of Marples & Co. Marples was a wholly owned subsidiary of Martin, Hall & Co, very reputed silversmiths. The spot-hammered shallow bowl raised on a slim pedestal base. M&Co for Marples & Co. Height: 5cm - 2 inches. Diameter: 12cm - 4 4/8 inches. 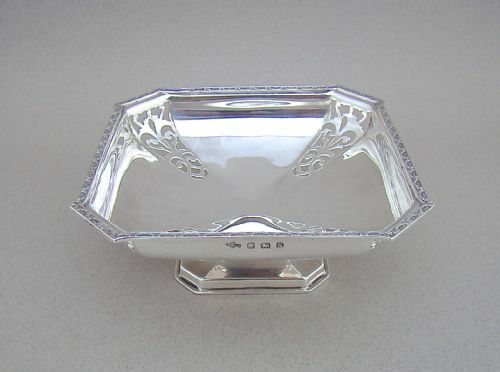 This is a very good quality, sizeable, silver sweetmeat dish hallmarked for London 1909 and made by Stewart Dawson & Co, Goldsmiths and silversmiths, retailing in Regent Street, London. 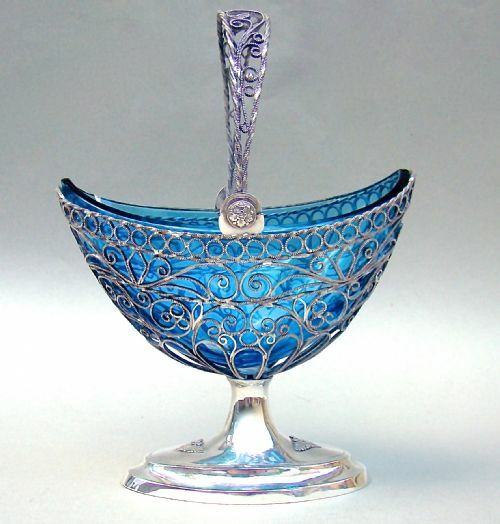 The dish is very characteristic of the Art Nouveau movement with its fluid and sinuous outline. Of shaped oval form, the wavy sides flanked by a pair of bifurcated handles, The base raised on four conforming legs. The dish has a very good weight. The high silver gauge is a testimony of its quality. Date letter "o" for 1909. Maximum Length: 22cm / 8.4 inches. Width 10cm / 4 inches. Weight: 283 g / 10 oz. 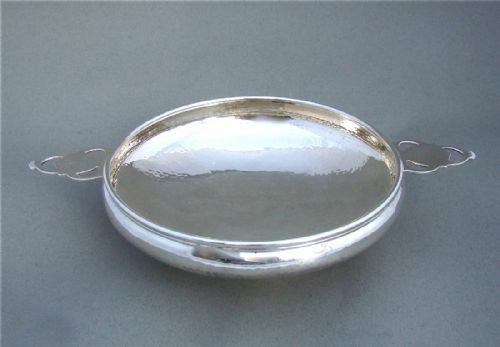 This is a good quality, sizeable, silver sweetmeat dish hallmarked for Birmingham 1937. Of canted square form, the sides pierced with scroll decorations. It has a pretty ribbon-tied border and is raised on a square pedestal base. AEP&Co Ltd for A E Poston & Co Ltd.
No loss to the pierced decorations. Depth 12.5cm / 5 inches. Weight: 141 g / 5 oz. 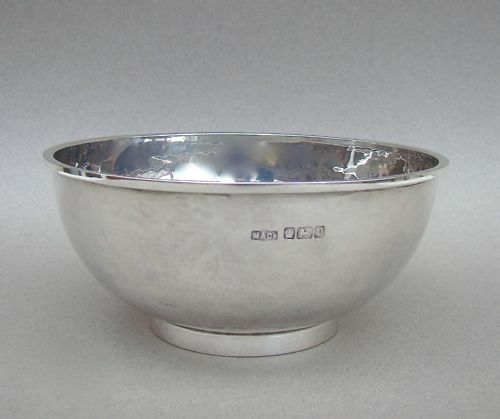 This fabulous Arts & Craft silver spot-hammered bowl was made by the highly sought-after silevrsmith A. E. Jones. The spot-hammered oval body with a distinctive pierced Celtic inspired galleried border and matching pedestal base. The base raised on four bun feet. Series number impressed on underside. Length: 12 cm/ 5 inches. This simple and elegant Arts & Craft silver, spot-hammered, 7 inches diameter dish was made by the highly sought-after maker A. E. Jones. It has a distinctive shallow form and is flanked by two "cut out" lug handles. Raised on a pedestal foot. Retailer's marks "Z Barraclough & Sons, Leeds" impressed at the base. Height: 5.5cm / 2.2 inches. Length from handle to handle: 10 inches / 25cm. 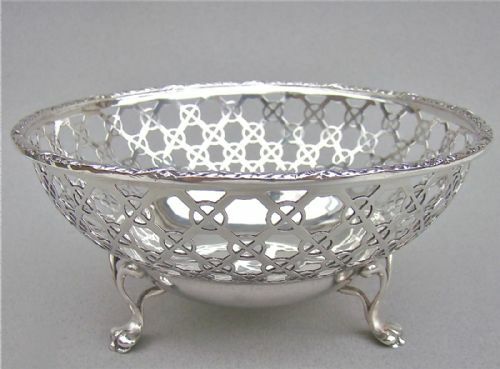 This exquisitely pierced and very elegantly shaped silver sweetmeat basket is dated London 1792 and was made by the prolific silversmith Henry Chawner. The shallow oval body is pierced and bright-engraved with stylised foliate patterns surrounding a vacant oval reserve. Raised on a pedestal foot and fitted with a rope-twist swing handle. It was used for all sorts of things, nuts, candy, dried fruits, sugar lumps. The removable ruby glass liner is perfect and appears to be the original liner. It is a perfect fit to the oval reeded border. Height with handle raised: 12cm / 4.4 inches. Width: 9cm / 3.4 inches. 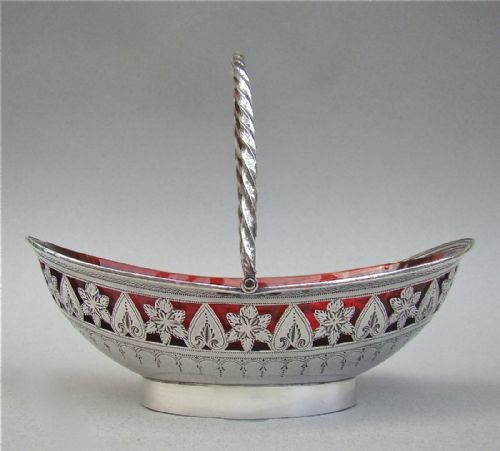 This exquisitely pierced silver sweetmeat basket is dated Birmingham 1905. The tapered body is pierced with leaves and scrolls surrounding two vacant oval reserves. Gadroon border and a rope-twist swing handle. The removable cranberry glass liner is perfect and is the original liner. It is a perfect fit to the scalloped border. Height with handle raised: 11cm / 4.2 inches. Diameter at its widest: 7cm / 3 inches. 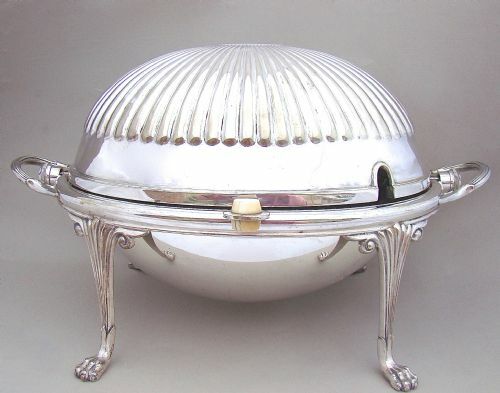 This is a beautiful Victorian silver plated breakfast dish with a revolving lid and complete with both original liners. The fluted domed shaped body raised on four cast fluted feet terminating in paws. The handle with ivory insulator knob. The interior fitted with the original trays, one solid, one pierced. The reserve with amusing presentation inscription. Length: 29cm / 11.3 inches. Very good. No dents, a few minor blemishes conmensurate with age. Stable on its feet. A superb and very elegant dish. 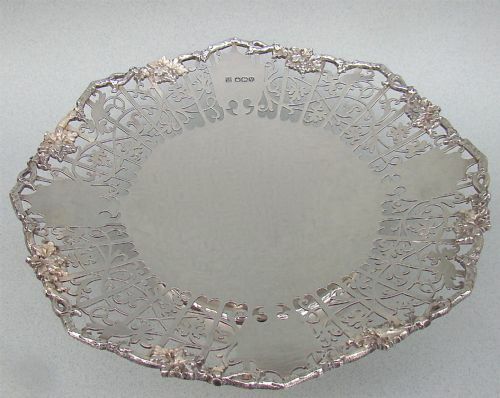 This is a superb quality, sizeable, silver sweetmeat dish hallmarked for Birmingham 1907. The circular dish, 5 inches across, has a solid base and sides pierced with lattice and roundels decorations. Raised on three bifurcated paw feet. It has a very good gauge of silver, a testimony to its quality. Diameter: 13cm / 5 inches. Height: 6cm / .2 inch. 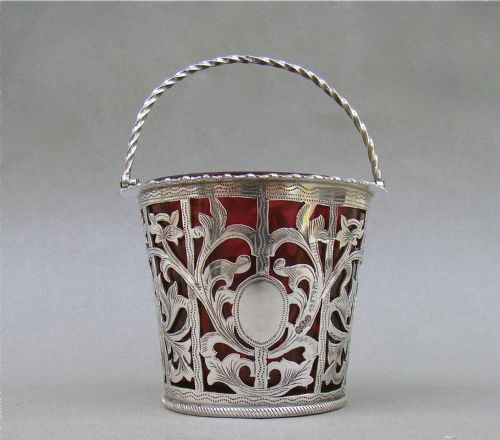 This exquisite continental silver filigree sugar basket is of navette form. The sides fitted with a filigree swing handle. The solid silver pedestal foot applied with acorns. The removable turquoise glass liner is perfect and is the original liner. Height with handle raised: 19cm / 7 inches. No loss to filigree decorations. 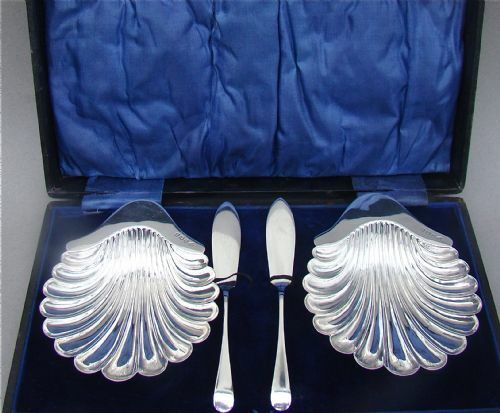 This elegant cased set of silver shell butter dishes with matching butter knives was made in Birmingham 1917 by Horace Woodward & Co Ltd. The knives are original and an exact match to the dishes, which is quite a rare occurrence.